When I pulled out a handful of their singles to play over the weekend, my kids asked who was singing. “Sounds like a new tea choice from Celestial Seasonings.” Man, they can so be quick sometimes. But most of us know otherwise. Me, I considered them my RnB Sonny & Cher. Through the years, there was one Herb and several Peaches. Six to be exact. 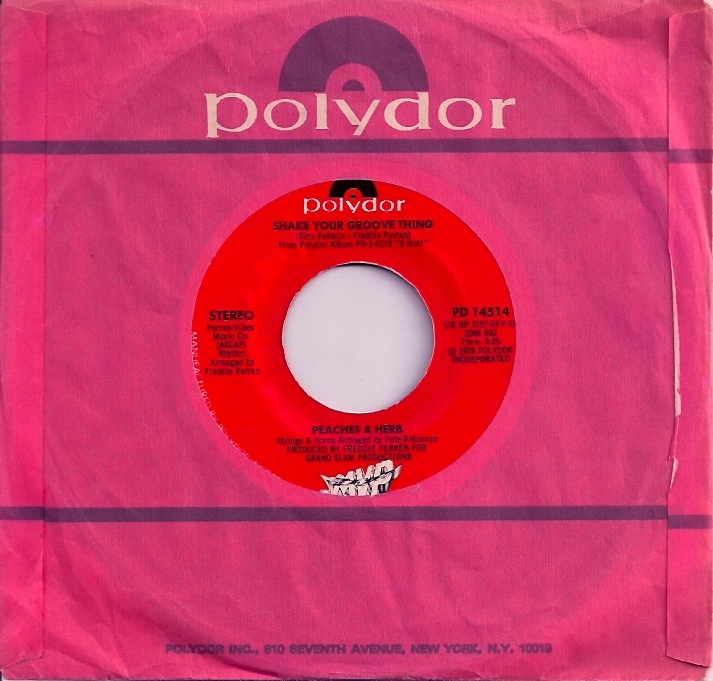 Initially signed to Date Records from ’66 – ’70, it’s former vocalist with The Sweet Things, Francine Day, who took the lead on all the recordings and is admittedly my favorite. Even after her retirement from touring two years in (Marlene Mack from The Jaynetts replaced her live), she remained Peaches in the studio. Every last Peaches & Herb single on the label is a must for any proper collection. 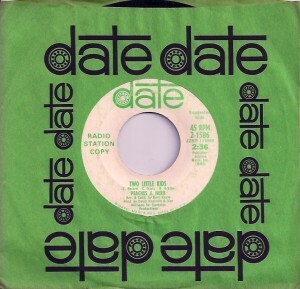 Despite my penchant for Northern Soul, and for Date Records, it’s this later single that is the riot worth posting. Everyone knows it. And once I got the riff into my head this morning, it was unshakeable, for the entire day. Linda Greene, the third Peaches, indeed does a great vocal on this one. ‘Shake Your Groove Thing’ – think about it. In some ways, the mainstream was much looser twenty or so years ago (Culture Club for example) than now. No matter. The record was massive (#5 US). Did every programmer just turn an blind eye to the lyrics? I guess so. So what exactly is a groove thing? This entry was posted on Thursday, September 9th, 2010 at 12:01 am	and is filed under Culture Club, Date, Francine Day, Linda Greene, Marlene Mack, Northern Soul, Peaches & Herb, Polydor, Sonny & Cher, The Jaynetts, The Sweet Things. You can follow any responses to this entry through the RSS 2.0 feed. Responses are currently closed, but you can trackback from your own site.